Active in Moscow since 1976, the Collective Actions group played a key role in the development of conceptual and performance art in the Soviet Union. Inspired by the work of John Cage, the organizers invited audiences to take part in minimal, outdoor actions in fields and forests on the edges of the city that explored the nature of the aesthetic event. These spatio-temporal events directed viewers’ attention to the pure contemplation of their own perceptions, and over time, the actions produced masses of documentary material. 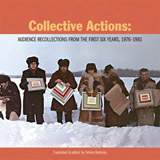 Collective Actions: Audience Recollections from the First Five Years, 1976-1981 concentrates on the early period of field actions when the problems of documentation—how to capture and convey ephemeral action to non-participants—were just beginning to be considered. Appearing for the first time in English, the subjective recollections presented here provide a counterpoint to the group’s better-known descriptive texts and theoretical writings, a selection of which are also included. Composed by several of Collective Actions’ regular audience members, the generously illustrated recollections share the author-participants’ idiosyncratic attempts to remember and give narrative to their own experiences of actions, and they illustrate the group’s ongoing investigation into the status of documentation in participatory art. YELENA KALINSKY is an art historian living in New York. Her dissertation, “Collective Actions: Moscow Conceptualism, Performance, and the Archive, 1976-1989” explores questions of performance, documentation, and collective practice in late-Soviet Moscow. Her translations of some of Collective Actions’ documentary and theoretical writings can be found on-line at conceptualism.letov.ru.